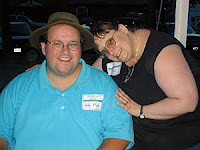 Hungry Bear Publishing was founded in 2004 by Andy and Dawn Flynn, of Saranac Lake, New York, to publish a compilation of Andy's weekly syndicated newspaper columns -- "Adirondack Attic" -- into book format. The column ran in several northern New York newspapers from 2003 to 2009. There are now six books in the Adirondack Attic series. In 2007, Hungry Bear Publishing added another author to its lineup -- Randy Lewis, of Paul Smiths, New York -- by publishing "Actively Adirondack: Reflections on Mountain Life in the 21st Century." In 2009, the company reprinted "Mostly Spruce and Hemlock," the 1976 classic history of Tupper Lake, New York by Louis J. Simmons, and has since published books by five other Adirondack authors: Diane Chase, Leonard Gereau, Christopher Buerkett, Edward Rogers and the Hohmeyer family. In April 2008, Andy received a Certificate of Commendation, Award of Merit, from the Upstate History Alliance (now Museumwise) for the Adirondack Attic History Project, which he founded in 2003 to actively preserve Adirondack history through the written word. By creating a unique partnership with the Adirondack Museum (now Adirondack Experience) in Blue Mountain Lake, New York, he has generated a collection of more than 300 artifact-based, human-interest stories from the museum's collection. In April 2010, Andy began working with North Country Public Radio to produce the Adirondack Attic Radio Series, which aired monthly until October 2017. In November 2017, Andy began producing programs for NCPR's North Country at Work project, telling stories about people's jobs throughout the Adirondack North Country Region. Listen to all of Andy Flynn's NCPR news stories and features since 2010. Hungry Bear Publishing is a home-based business and does not accept submissions for publishing at this time. In addition to producing books and radio programs, Andy travels around the Adirondack region and beyond giving lectures and workshops based on his experience in the self-publishing, history, journalism and public relations industries. Andy's writing has been published in magazines such as Adirondack Life, Bluegrass Unlimited and the New York State Conservationist. The Flynns live in Saranac Lake. Dawn is a 1979 graduate of the Saranac Lake High School. Andy is a 1987 graduate of the Tupper Lake High School and is currently the editor of the Lake Placid News. He was assistant managing editor at Denton Publications (2011-2013) and worked as the senior public information specialist at the New York State Adirondack Park Agency Visitor Interpretive Center in Paul Smiths (2001-2009). Dawn is the former assistant circulation manager at the Adirondack Daily Enterprise, and Andy is the former managing editor of the Enterprise. They met at the Enterprise.